I had an old post for this, but they changed the look about a week later and now they've changed how the whole thing works. So here is a new one. USGS makes their maps available for free in PDF format. This collection includes historical maps as well as the current set in various scales. Once in a while I claim I am wandering up a peak to see if I can find a benchmark that is on a 1905 map. It isn't that I have some magnificent collection of maps, brought together by a grandparent and parent and kept up by myself, filling an entire basement. It's just that I downloaded the historic map and gave it a look over to see if it had anything interesting. I had an older version of these instructions, but the interface has changed significantly, so this needs updating. Now find the region where you want to download maps. This can be done by navigation dragging the map around and using the "+" and "-" buttons in the upper left to zoom. This can be a frustrating process since the map does not zoom in when double clicked. It does respond to pinching and pulling. Another way is to simply search using the blank bar at the top. Fill this in with what you want and press "enter" then select the one that seems most like what you are looking for from the choices that appear. It is not a very smart search, so even when it only comes up with one possible meaning for what you typed, you will still have to select that. Further, it may not offer what you want from a shorter search. For instance, I typed in "hildreth" to get the Hildreth Peak quadrangle for my my example and was presented only with the option of "Hildreth, California, United States" which is, it turns out, a small bump outside of Fresno called Hildreth Mountain on the Millerton Lake West quadrangle. Before, I could specify that what I typed was a quad name, but now I have to be more complete. The locator drops a big, blue pin in the spot it has found for you. If you are navigating to the location, you will have to double click to drop a pin. A box will pop up saying where it is with a "View Products" button. 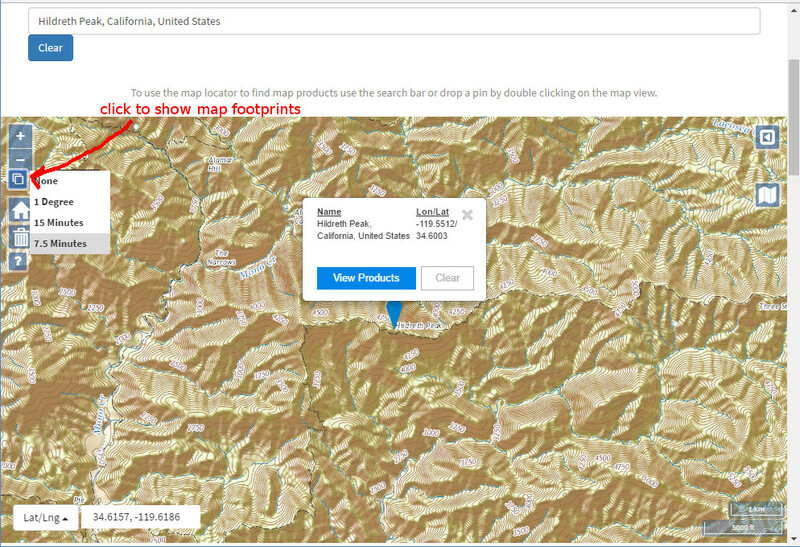 Click the "View Products" button to get a list of maps for the area. You will actually see quite a lot of products as you scroll along, including some from the National Forest. (There are two scroll bars, one for the page and one for the box containing the products. Be sure to use the right one to see all the options.) Unless filtered out, this will show maps in all scales and for all years. For dates, pull the slider on the left to not see the older maps that are sometimes only good for trivia and pull the slider on the right to not see the useless 2012 series that tends to be missing trails and even roads. As you scroll, you'll find that there is more than one 7.5' scale map. Before, the downloader only showed the maps that covered the exact spot you selected. Now it shows everything in a radius. This is good in that it is often useful to have the neighboring maps but bad in that you may not know all of the maps that you want. To see what area a map covers, click on the double square just under the zoom buttons and select from "1 Degree" or "15 Minutes" or "7.5 Minutes". And the footprints will show with labels. That should be enough to download all the maps you might want. There are a couple other options. National Geographic has a set of 7.5' maps cut into quarters for easy printing on 8.5"x11" paper. Each piece of map has tick marks along the side for coordinates, which you do not get when just printing out the relevant portion of the larger PDFs available from USGS. There is only one option for each map, but there does seem to be some curating done on the collection. There is also some processing, so the maps have a consistent look. They are done in a lower quality and things like typed labels are sometimes hard to read. Caltopo provides an interface for developing your own maps and printing custom areas. There are other maps available such as Forest Service maps. This is a much more sophisticated method and thus much more complicated. It has its own tutorial to help make it accessible. The local Sierra Club chapter has a weekly conditioning hike every Wednesday evening, inviting all who feel capable of a 6-10 mile hike to meet at the Mission at 6:30 PM. For around the solstice, we have been doing a couple special hikes. 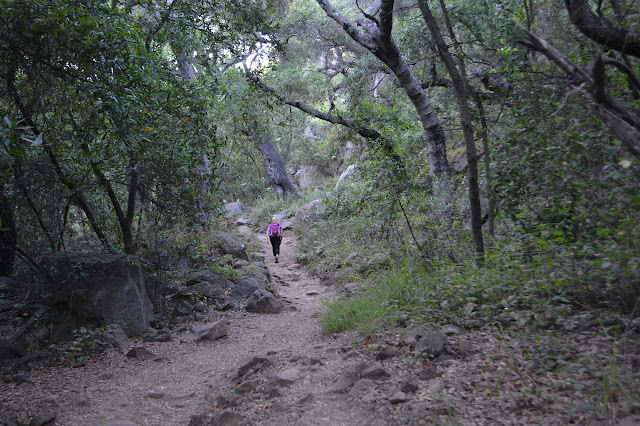 Last week, we climbed up the use trail from Jesusita Trail to Cathedral Peak, then continued on to La Cumbre at the top. It would not have been a good trip for a new attendee. This week is a party up on top of Montecito Peak. It would be much more appropriate for a new comer and similar to one hiker's first hike ten years before. I request heading up along the creek rather than the old guerrilla trail and no one else has an opinion, so that is what we do. It is a half mile longer, but keeps us out of the hot sun longer. It also offers some flowers to help celebrate the start of summer. 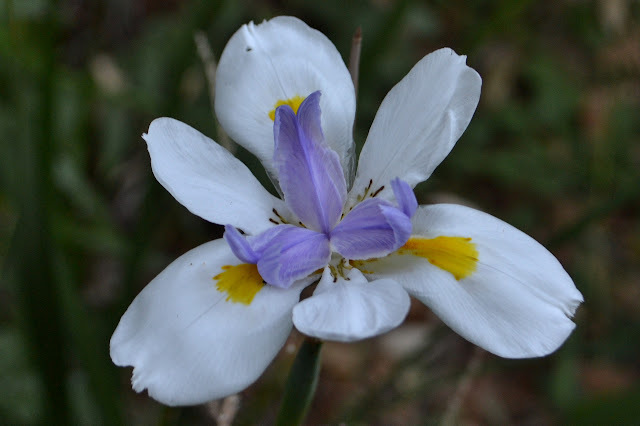 A single iris in the canyon, but it is at a perfect moment. Hiking on in the evening canyon shade. National Trails Day is the first Saturday in June, which can be a touch on the hot side in the local backcountry. Still, there is a great enthusiasm for it and there are always a few events around. I decided to hop over the hill to see Santa Cruz again. I hiked it after the burn, but rain storms had come after to add further injury. We gather at First Crossing even though we were meant to gather at Lower Oso because the gate is mysteriously closed. Apparently the new management company has decided that this is where the day use areas get closed overnight and that overnight should be from 5 PM to 8 AM. The advantage of using the other gate being that there is a clear sign warning about the closure so that people do not get locked in. There is some grumbling from people who have already been locked in without any reason to think it would happen. When the Parks Management employee sees fit to open up the gate around 8 AM, we can finally get moving to and through the expected locked gate. The road to Upper Oso is closed because of damage to the campground and road surface. It looks like the high water was as far over the bridge as the bridge is above the creek bed. However, the road has been in decay for so long that I cannot see any damage that was not already there. 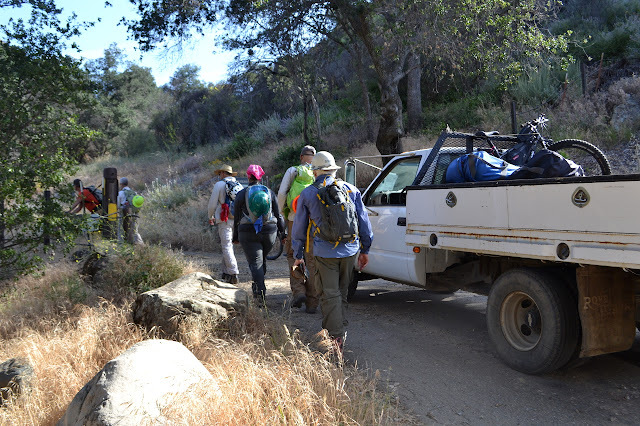 Parking in the upper lot, all but a few of about 30 volunteers walk the last 0.7 miles up the road to the trailhead. Pushing open the last gate to the OHV road to let through a lot of hikers and the truck of tools.